On Tuesday afternoon I stopped by Lighthouse Point to see what was moving. The hawks were decent, as expected on a NW wind. However the bright blue sky made everyone work hard to spot each bird. I only stuck around for about an hour since the day's flight was slowing down quite a bit. On my way home I took a walk around East Shore Park in New Haven. A handful of birders have known about this little coastal gem for many years, but I really only discovered the place last autumn, when I lucked into a few Cave and Northern Rough-winged Swallows feeding over the adjacent sewage treatment plant. The Rough-wings continued into the winter before disappearing, presumably succumbing to the weather. Still, the attempted wintering of this species in CT was very notable. A few Red Crossbills (type 4) also made an appearance last year. The stretch of pines, sumac, and shrubs along the park's northern edge attracted a surprising number of half-hardy landbirds late into the autumn. So on Thursday, while walking along that northern edge, I was not surprised to find many Yellow-rumps, Palms, and a few Blackpolls. I looked up to find two Barn Swallows and a flock of 6 Northern Rough-winged Swallows feeding in the vicinity of the sewage plant. Maybe a trend is developing at this location. We'll have to keep a close eye on the swallow situation here as the season progresses. In speaking with Julian Hough earlier that day, he mentioned that he had a Rough-wing move through Lighthouse Pt that morning. Switching gears....this evening I 'celebrated' the completion of my first rotation by walking halfway out Sandy Point. It was pretty much empty: 3 BB Plovers, 7 Gr Yellowlegs, and several Sanderling made up the shorebirds. 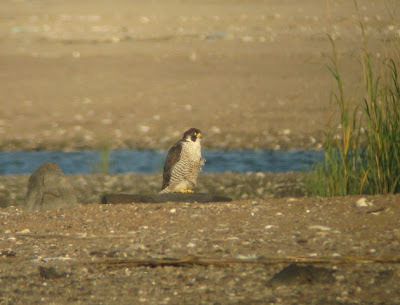 This adult Peregrine might have had something to do with the vacancy.